Here’s a sobering statistic: the average American adult watches a staggering 4 to 5+ hours of television per day. It seems that in this season of light, the “light” that shines through the darkness comes from our televisions, computers, tablets, and smartphones. Frankly, I don’t know where Americans find that kind of time, or how they find that many shows worth watching, or why they don’t use that time toward other ends. In our household, it’s relatively easy for days to slip by when I never plop down in front of the TV. Or if I do, it’s at the end of a long day to decompress for 30 minutes or an hour. But certainly not 4 or 5 hours! As a family collectively we’re watching even less television this month, when our self-styled daily Advent calendar reveals a family-oriented activity that brings us together and keeps the TV off. When we do watch television, however, odds are very good that we’re tuned in to a cooking show on Public Television’s Create channel. Our viewing appetite ranges from America’s Test Kitchen to Lidia’s kitchen, from Nick (Stellino) to Rick (Bayless), and from Ming to Jacques. I’m also somewhat loath to admit that we also sometimes watch Martha Bakes. Martha, oh Martha. At least half the time we’re aghast and chuckling at her outlandishly snobbish statements. But sometimes we’re getting genuinely inspired for recipes we want to develop in stellar gluten-free form. 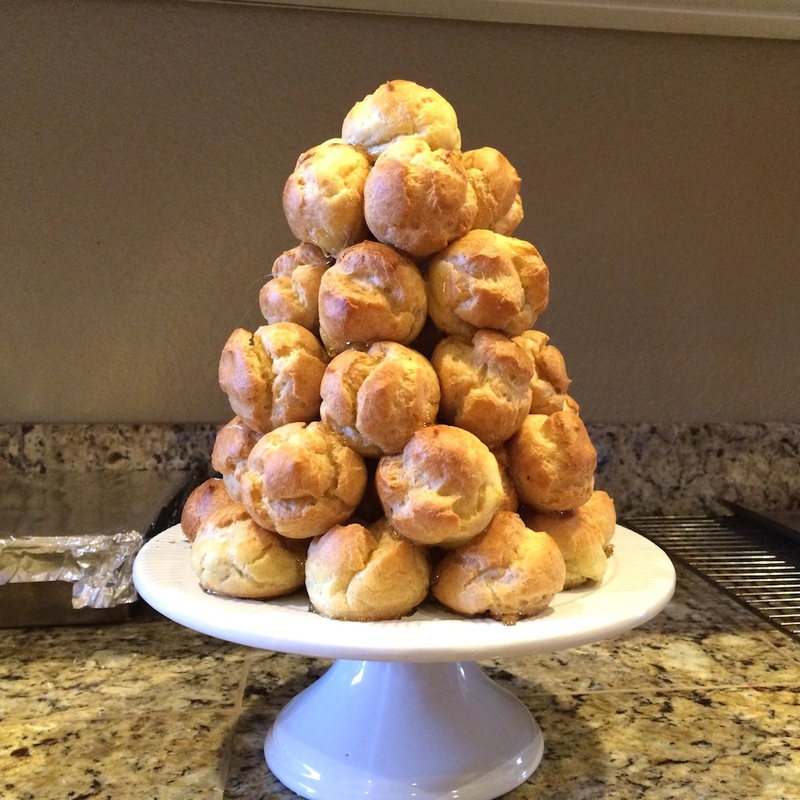 As you might guess, this recipe for croquembouche is just such a recipe. A croquembouche is a classic French pastry based on an eggy pate a choux dough. 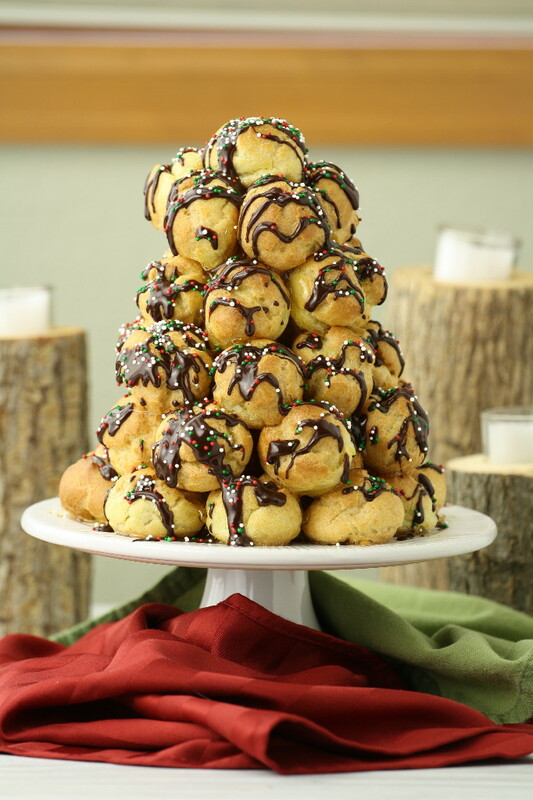 It starts with a truckload of golf ball-sized baked profiteroles (aka cream puffs), which are choux pastries filled with pastry cream or whipped cream, and then assembled into a grand tower held together with sugary caramel. Finishing touches include endless possibilities, from a web of spun sugar strands to a generous drizzle of chocolate ganache. It was some months ago when Martha made a croquembouche, but I still remember distinctly thinking, “we can and should make that.” It seemed on the one hand a grand challenge to make gluten-free. 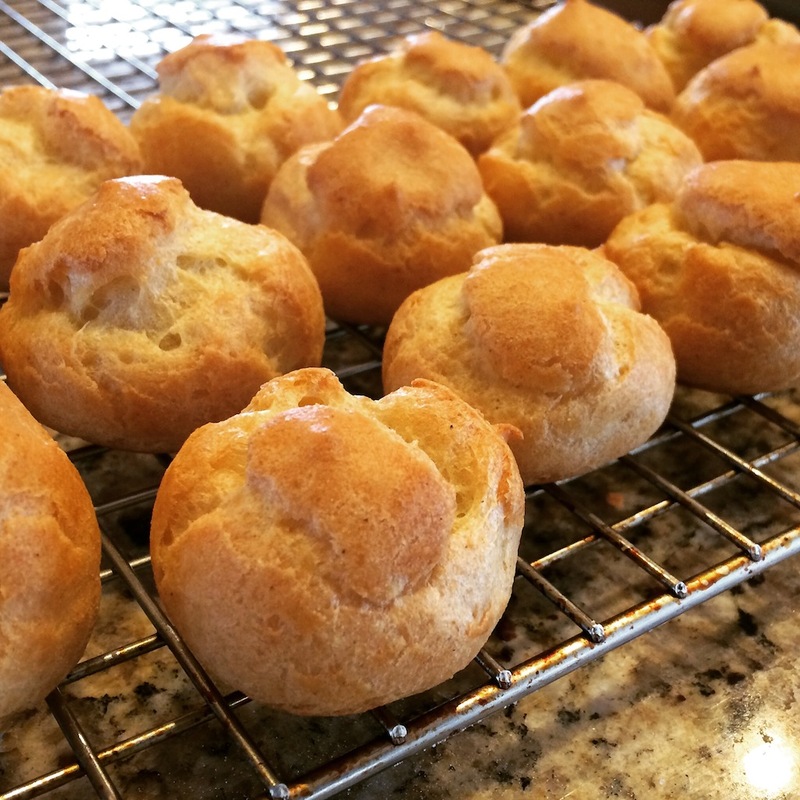 On the other hand, we’d done gluten-free choux pastries before, from the beignets in Artisanal Gluten-Free Cooking, 2nd Edition to our recipe on this blog for almond choux florentines to eclairs and cream puffs before that. And so I felt confident we could go into the kitchen and (eventually) emerge victorious. 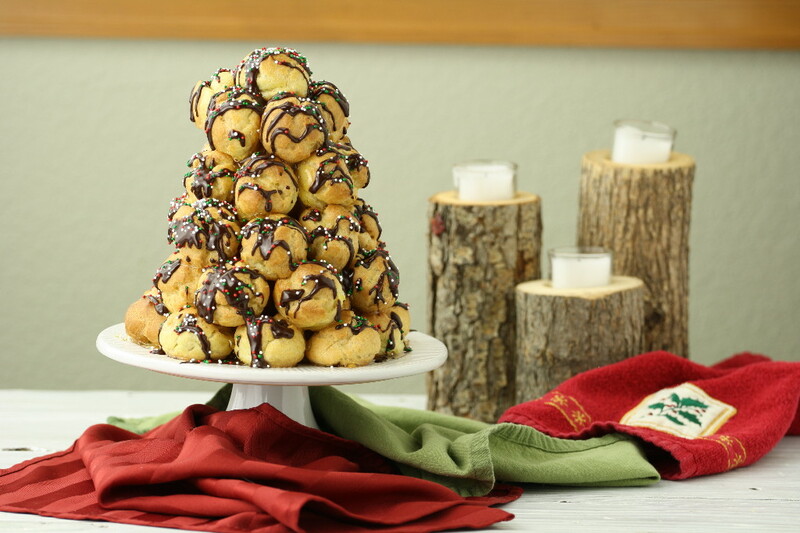 All the better if we could achieve success during this holiday season and debut a gluten-free croquembouche decorated to resemble a Christmas tree of sorts. It wasn’t all easy, smooth sailing from there. We still faced the issues of a modified version of our pastry cream, filling the profiteroles, assembling the croquembouche, and decorating the thing. It’s time intensive, but then again, so is a “regular” croquembouche, and the result is certainly worth it. In the end, we succeeded in what we’ll probably remember as one of our crowning recipe development achievements of 2015. And, to quote LeVar Burton from Reading Rainbow, you don’t have to take our word for it. Our older daughter, Marin, has called an audible for her forthcoming birthday party and—in lieu of a proper birthday cake—requested a croquembouche instead! In a saucepan, heat the milk over medium-high heat until bubbles form around the edge. Meanwhile, in a bowl combine the yolks, sugar, and cornstarch. Whisk until pale yellow. Temper the egg mixture: while whisking slowly pour about half of the hot milk into the egg mixture, then pour the egg mixture back into the saucepan with the remaining milk, again while whisking. Return to the heat, and bring to a boil, stirring constantly. Boil for 2 minutes. Remove from the heat and stir in the butter and vanilla. Preheat the oven to 425 deg F. Line two baking sheets with parchment paper. In a medium saucepan, combine the water, butter, sugar, and salt, and bring to a boil over medium-high heat. Remove from the heat. Then add the eggs, one at a time, stirring to incorporate after each addition until smooth and glossy. Transfer the dough to a pastry bag fitted with a round, half-inch tip. Pipe mounds of dough about one inch wide by one inch tall onto the baking sheet, two inches apart. The recipe will yield about 50 across the two baking sheets. Bake each sheet, one at a time, for 25 minutes each. In a chilled metal or glass bowl, whip the heavy cream until soft peaks form. Remove the pastry cream from the refrigerator. It will be firm. Whisk the cream until loose and smooth. Then fold or whisk in the whipped cream. Transfer the pastry cream to a pastry bag fitted with a quarter-inch-diameter round or star tip. Poke the tip into the bottom of each pastry and fill with cream. In a small saucepan, combine the sugar and water. Cover, bring to a boil over high heat, and let cook for 5 minutes. Build the base of your croquembouche by dipping the bottom of individual profiteroles in the caramel and arranging on a plate or cake stand. For subsequent layers, dip the EDGE of the profiteroles in the caramel and build the tower with the tops of the profiteroles facing OUT. Place additional profiteroles on the interior as necessary to continue building the structure. Heat the milk until just boiling (glass bowl in the microwave or small pot on the stove). Remove from the heat. Whisk in the chocolate until smooth and shiny and the chocolate is fully melted. You do not know what this means to me. I am French and my husband and 2 sons have Celiac and living in the US, the opportunity for gluten free croquembouche- heck gf profiteroles or any kind of gf French like pastries- is close to zero. Pulling my sleeves up and trying your puffs first, then hopefully the croquembouche. I have until May to figure it out( big family celebration which would normally be accompanied by a croquembouche in France). You’re very welcome! That’s what it’s all about… enjoying tasty gluten-free versions of recipes that are important to cultural heritage. That is what started us on our recipe development journey originally in 2007. Thank you so much for this recipe. After a few gluten free Christmas recipe fails, I was beyond frustrated. This recipe turned out perfectly and was delicious. Hi Jen. We’re so glad to hear you enjoyed the recipe! Happy New Year!